It looked like the end of nationhood for God's people as they faced a punishment they most surely deserved. But Isaiah saw beyond Judah's captivity by the Babylonians to a time of remarkable restoration. God's people would return to their homeland, rebuild the Temple and re-establish themselves as a nation. They would also rediscover their divine destiny as the Lord's servant; a destiny that would in due course be enshrined in one Man, Jesus of Nazareth, the Messiah and the Saviour of the world. We are always somewhere on the roller coaster of life, death and resurrection, whether in our personal lives or in our churches. This Bible study helps us to understand Isaiah's powerful message for each of us, that God is a holy God who cannot ignore sin, but One who also displays amazing grace and mercy, and a longing to enjoy restored relationship with us. 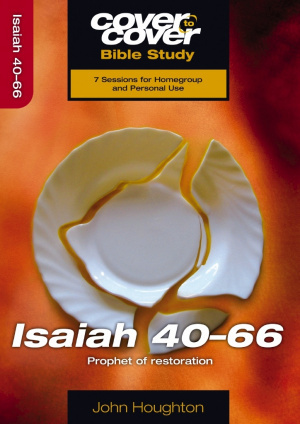 Cover To Cover Isaiah 40-66 by John Houghton was published by CWR in April 2010 and is our 13049th best seller. The ISBN for Cover To Cover Isaiah 40-66 is 9781853455506. Be the first to review Cover To Cover Isaiah 40-66! Got a question? No problem! Just click here to ask us about Cover To Cover Isaiah 40-66.